Sviyazhsk seems ready to settle underneath the waters of the Volga River. A motley of churches, bell towers, and teetering homesteads is all that remains above ground. The city was once a fortress town of great strategic importance and home to over 10,000 people. A face-off had been brewing in the middle of the 16th century between the Khanate of Kazan and the growing power of the Muscovite Tsar for control of the middle reaches of the Volga. Kazan at that time was the capital of the Khanate – an unassailable fortress that had already shrugged off multiple assaults by the Tsar’s forces. Difficult lines of communication prevented the Muscovite forces from conducting a protracted siege. During one of their retreats in the autumn of 1550, the Tsar’s troops made camp on the banks of the Volga near the confluence with the Sviyaga River, a day’s march from Kazan. This was when Ivan the Terrible conceived the idea of building a fortress settlement here. The wooden fort took just a month to erect, making Sviyazhsk the main Russian base for the assault on Kazan. The "Conqueror of Kazan" has not gone down in history as a temporary military stronghold. After the defeat of Kazan, it remained an outpost of Christianity in a Muslim region. 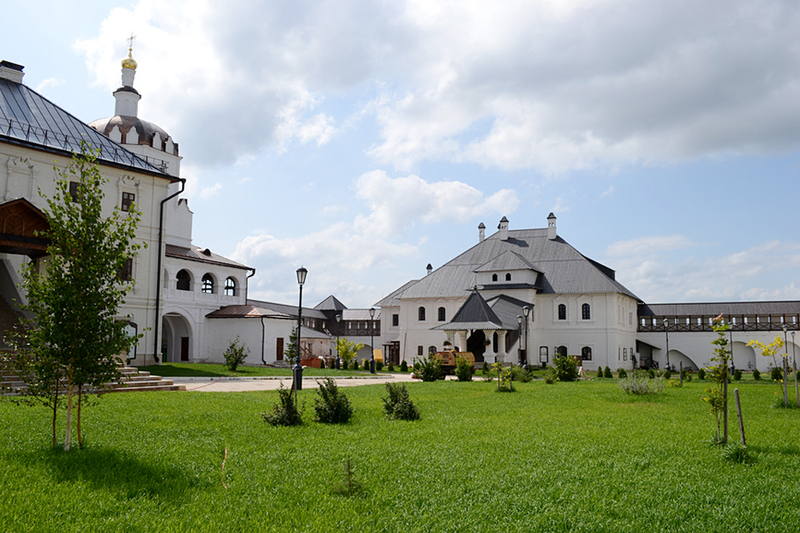 Sviyazhsk was preserved and was slowly metamorphosed into a county town with parish churches and merchants’ mansions. During the Civil War, Sviyazhsk again came to the forefront of Russian history. In 1918, Vladimir Lenin sent Leon Trotsky to rid Kazan of the White Guards, who had gained access to the Volga. The grimmest days in Sviyazhsk’s history came during the first half of the 20th century when a forced labor camp was opened here by order of Joseph Stalin in 1924, followed by a Gulag camp that operated within the walls of the Holy Dormition Monastery from 1935 to 1953. In 1952, the Holy Dormition Monastery was converted into a so-called psycho-neurological clinic – it is no coincidence that there are tombstones of murdered monks and political dissidents as well as many collective graves here. Yet the culmination of Sviyazhsk’s story came in 1957, when the entire area around it was flooded during the creation of the Kuibyshev Water Reservoir, leaving only the downtown above water. The historic centre was saved only because it had been built on a commanding bluff. It was not until 2010 that ownership of the churches and chapels on the island was restored to the Russian Orthodox Church, and a charity fund was founded to collect money for the restoration of the historic buildings. The monastery on the island is now inhabited by 25 monks and novitiates. When the waters aren’t iced up, there’s a daily two-hour-long ferry which runs to the island from Kazan. In 2008 a dam was built to offer an alternative mode of access to the island. A railway now connects the nearby village of Nizhnie Vyazovye and Sviyazhsk. Until recent years, the only access to Sviyazhsk Island was by boat. During navigation season, when the waters aren’t iced up, there’s a daily two-hour-long ferry which runs to the island from Kazan. In 2008 a dam was built to clear up some of the waters flooding the island. A railway at the nearby village of Nizhnie Vyazovye now provides an alternate way of accessing the island. You can easily get to Sviyazhsk by train serving the route Kazan-Sviyazhsk. The trip duration is about 1,5 hours. There are no hotels in Sviyazhsk. You can find a hotel in Kazan.